Catznip R11: jelly dolls, Bento, oh my! On Sunday, December 1tth, Catznip R11 arrived, bringing with it a lot of Lab love and Kitty goodness. With the last update having been back towards the start of 2016, there are quite a few updates and features from Linden Lab, and well as some niceness from the Catznip team themselves. In particular, this release picks up on the Lab’s Avatar Complexity capability and graphics presets, and also include Bento avatar skeleton support, as well as a raft of Lab changes such as HTTP co-routines, CEF, LibVLC, voice improvements, bug fixes, and more. This is not intended to be a comprehensive review of Catznip R11; rather, the hope is to provide an overview of the more major updates and changes. Information on all changes can be found in the release notes (when available – link to be added). There are probably very few in SL who have not heard of Avatar Complexity, be it by that name or its more popular nickname, Jelly Dolls. However, for those who need a quick re-cap and run through, here’s the deal. You can use graphic presets (see below) to save different avatar complexity settings for different circumstances (e.g. a very low limit for crowded places, a much higher limit for home use, etc.). In all three cases, moving the Maximum Complexity slider to the right increases your threshold, allowing more avatars around you to be fully rendered, while moving it to the left decreases your threshold, increasing the number of avatars liable to be rendered as solid colours. Changes made in one slider will be reflected in the others. 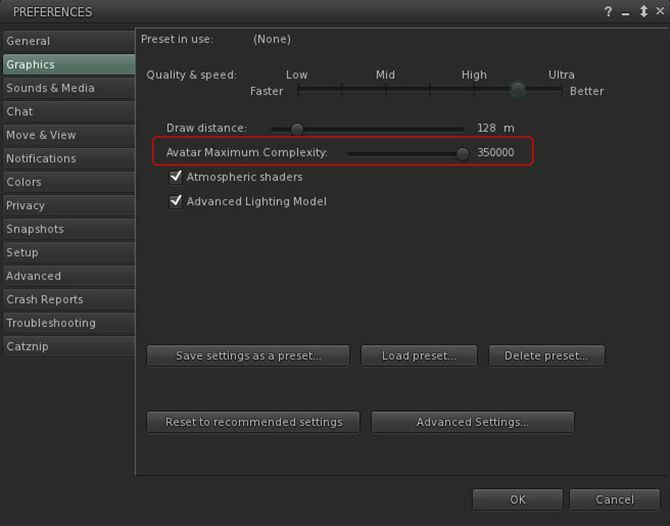 Note that you can set the Maximum Complexity slider to No Limit (all the way to the right). However, this isn’t recommended because it leaves your viewer vulnerable to any graphics crashers some inconsiderates still occasionally try to use. It is far better to set your viewer to a high limit (e.g. 350,000) if you don’t want to be bothered by seeing Jelly Dolls. The attachment surface area for an avatar, expressed in square metres. The complexity value of your avatar is transmitted to each simulator as you travel around Second Life. In return, you’ll get a brief notice in the upper right of your screen telling you the approximate percentage of avatars around you who are not fully rendering you because of your avatar complexity. If you always wish to fully render certain other avatars, no matter what your Maximum Complexity setting, you can right-click on those individuals and select “Render Fully” from the context menu. Conversely, if there are avatars around you whom you’d rather render as grey imposters, right-click on them and select “Do Not Render” from the context menu. You can also revert any avatar exceeding your Maximum Complexity setting by right-clicking on them and selecting Render Normally from the context menu. They will become a Jelly Doll once more. Finally, Avatar Complexity does not replace Avatar Imposters, but rather is intended to work alongside of it, offering another means to reduce avatar rendering load on your computer. If you attach a HUD which makes heavy / excessive use of large textures and which, as a result, can impact your system’s performance, the viewer will display a warning to indicate the problem and which names the HUD. It will naturally fade after a set time has passed. 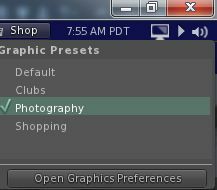 Graphics Presets allows you to easily save and restore different sets of graphics settings within the viewer, which can then be used according to need. So you might have one with all the performance-hitting options enabled for when you’re taking photos, and another with many of them turned off, as they’re not really needed (e.g. for shopping or clubbing, etc. ), for example. You can then swap back and forth between them as needed via a drop-down options list and without any need to relog. There is no limit to the number of presets you can create, and any you no longer require can be easily deleted. 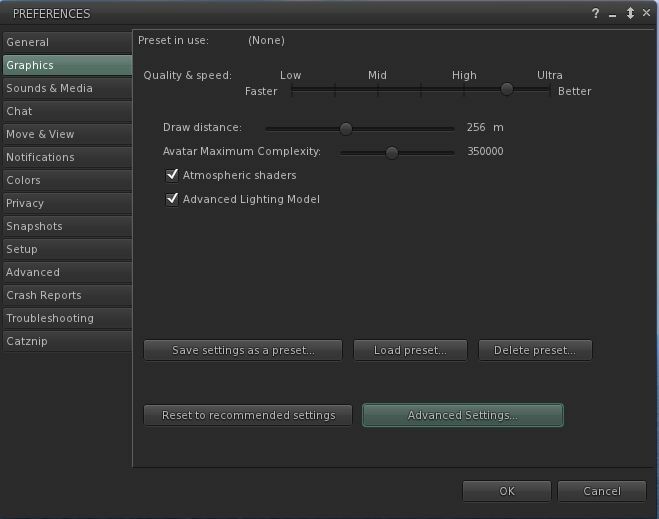 To create a new preset: go to Preferences > Graphics and open the Advanced Graphics Preferences floater. 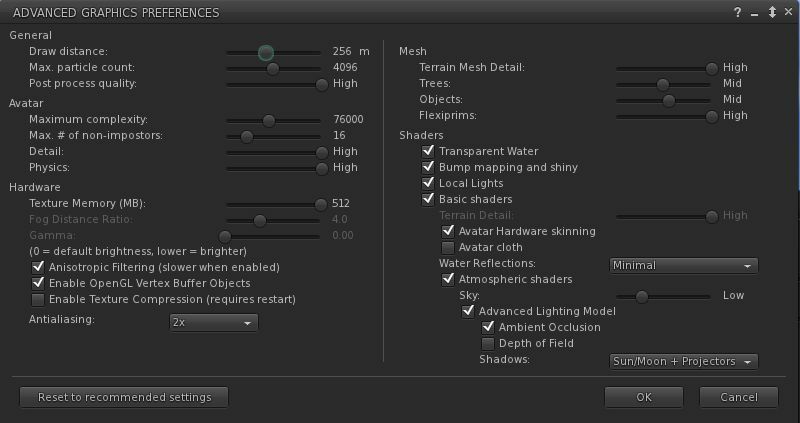 Set options like Quality and Speed, Draw Distance, lighting / shadow options, LOD values, avatar rendering, etc., to suit a specific use (e.g. at a club or venue or for photography, etc). When you have done so, click OK to apply the settings. In Preferences > Graphics click on Save Settings as a Preset. A pop-up is displayed asking you for the name of the preset. Enter a suitable name (“indoors”, “shopping”, “photography”, “ultra”, whatever suits the set you are creating) and click Save. To delete a preset: go to Preferences > Graphics and click Delete Preset… Use the drop-down list in the displayed dialogue box to select the required preset and click Delete. note that a confirmation isn’t requested. To Load a preset: you can load a preset via the Preferences > Graphics and use the Load Preset… button. Use the drop-down list in the displayed dialogue box to select the required preset and click OK. However, a quicker way is to use the Graphics Presets icon (aka “the TV screen icon” in the top right of the viewer window. When the mouse is hovered over this icon, a list of all saved pre-sets you have created is displayed, a tick appearing alongside the one currently being used. Clicking on any other pre-set will immediately apply it. In addition, this panel also has a button which will open the viewer’s graphics settings in Preferences. The introduction of Avatar Complexity and Graphic Presets bring with them a change to how the Graphic Preferences options are presented in the viewer. 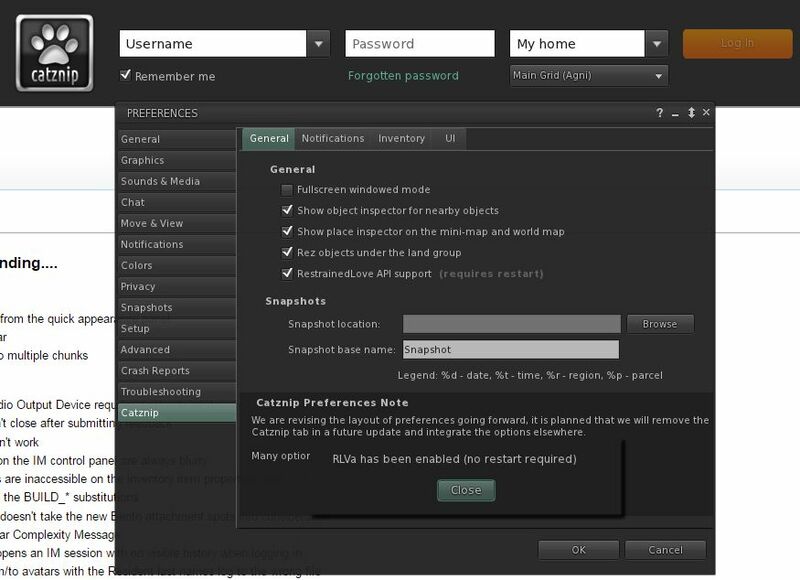 Whereas with previous versions, all of the options were displayed in a single tab in the Preferences floater, they have been split between the Graphics tab and a separate Advanced Graphics Preferences floater. The former (directly below) displays those options Linden Lab believe users will wish to access the most frequently – the Quality and Speed, Draw Distance and Avatar Complexity sliders and the toggle options for Atmospheric Shaders and Advanced Lighting Model, together with the Graphics Presets buttons and current setting. The Advanced Graphics Preferences floater (below) also contains the sliders and toggle check boxes described above, together with the remaining graphics options found on the Graphics tab in previous viewer releases. As most people are aware, Project Bento is a collaborative project between the Lab and content creators to improve and enhance the Second Life avatar skeleton to make it better meet the needs of mesh avatars (Bento does not work with the Second Life system avatar). It adds numerous new bones to the avatar skeleton, allowing easier creation and animation of things like additional wings and limbs, and offers the opportunity for greater facial animations with mesh heads and faces, and even finger manipulation on mesh hands. In addition, Bento provides a set of new attachment points to work with the new joints – however, the overall limit of the number of attachments you can wear at any one time remains 38 (including HUDs). Most of all of this work is entirely under-the-hood. 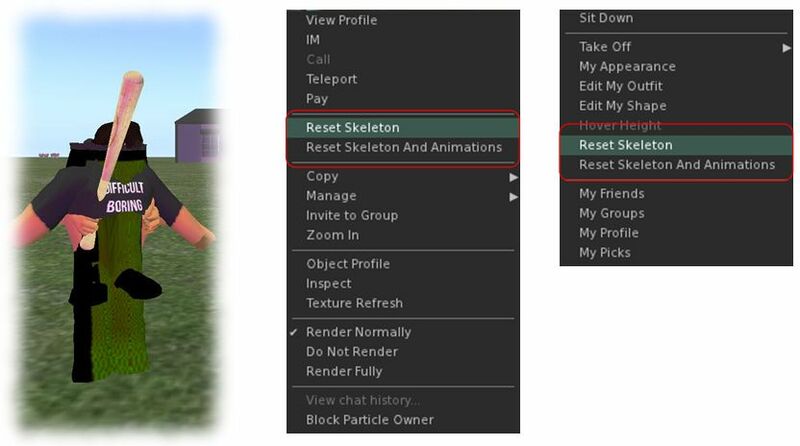 However, there are two additions to the avatar right-click context menu for both your own and other avatars: Reset Skeleton and Reset Skeleton And Animations which should be noted. They have been added because sometimes, when changing between one mesh avatar and another, the basic SL avatar can become deformed, resulting in it looking squished, stretched, caught between two looks, or something else. Note than anyone not using a Bento-capable viewer will see Bento avatars “deformed” or “melted” and will also see any attachments using the new Bento attach points rendered in the avatar’s chest. Catznip R11 includes the latest HTTP changes from the Lab. While invisible in normal viewer operations, these new HTTP capabilities provide improved performance and stability, and allows the viewer a greater degree of control and management over the numbers and types of HTTP requests that can be simultaneously outstanding. In addition the updates from these changes remove a considerable amount of deprecated and unused code from the viewer. Those interested in the minutiae of these changes, please refer to the Lab’s video presentation on them. Voice improvements including fixes for: SLVoice process continuing to run after logging out; Voice quality issues; Voice remaining connected after teleporting to another region (requiring s re-log to fix); Voice crashing on a USB device change, etc. Extensive reworking in handling mini profile icons: these updates drastically reduce the amount of texture menu used by mini profile and group icons, thus helping to reduce instances of texture thrashing. Quick Windlight – change WindLight presets easily. Toggling RLVa on / off from Me > Preferences in the log-in / splash screen no longer requires a viewer restart to take effect. This is a significant update to Catznip, one which brings it very much up-to-date with the Lab’s code base and presents users with capabilities such as Avatar Complexity and Project Bento. The nips, tucks and improvements to both the viewer and RLVa are liable to be welcomed as well. I confess that Catznip is not my primary viewer – but it is very much one of my preferred viewers, and one I have no hesitation in recommending to those seeking a TPV alternative to Firestorm. This update ensure this very much remains the case. One thing that is missing from this update that is found in the official viewer is the Visual Outfits Browser (VOB). As most Catznip users may already use the viewer’s ability to preview textures in inventory by hovering the mouse over them, and assuming they have images of their outfits in their folders, it is possible a lack of VOB functionality may pass largely unnoticed until such time as it may be implemented. I tried the “jelly dolls” business and then just shut it off. When someone asks you about your opinion of their new dress/suit/RP outfit/etc. and all you see is a crude shape, it’s annoying and embarrassing. Then I discovered that with Firestorm you can shut the thing off and I did. No more “Oops, I can’t tell” or “Your new WHAT?”. Now I can honestly say “Your new outfit tells me there is a cold horse somewhere,” and honestly mean it.